Jerry, a rescued female chimp at Tacugama Chimpanzee Sanctuary in Sierra Leone, had a contraceptive implant - the same kind that people use to prevent pregnancy. But as these things sometimes do, Jerry's birth control failed. "We are not sure why, but they are not 100 percent safe," Sofie Meilvang, program manager at the sanctuary, told The Dodo. "She might even have removed it, without us noticing." The result of this little blip arrived at the end of last year: Joko Junior was named for his dad, who sadly passed away before he was born. 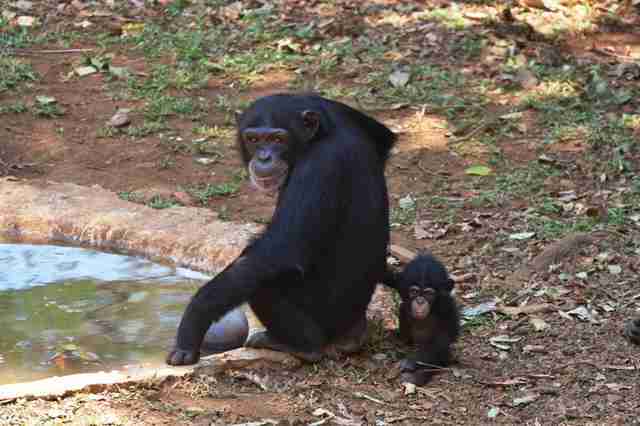 Even though Jerry is a single mom, she's luckily getting a lot of help from the community of chimps at Tacugama. 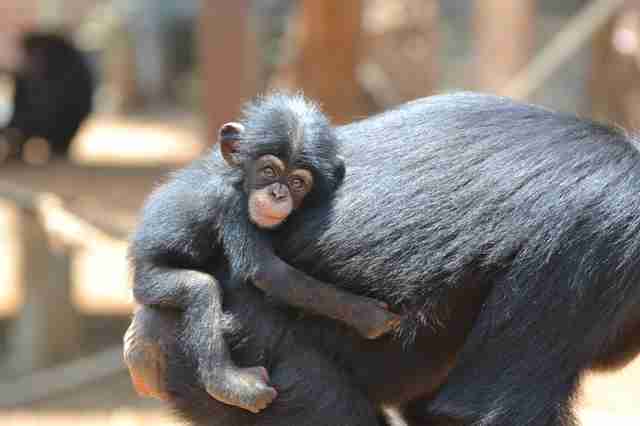 "Joko Junior lives in a group with four female chimps," Meilvang said. "His mum, Jerry, and the three other females, Jerusalem, Gola and Yoyema." Normally, the sanctuary doesn't breed chimps. "We want to save our resources, money and space, for the rescued chimps," Meilvang explained. This is because the chimps in the region need all the help they can get. "All the chimps at Tacugama are orphans because of bushmeat hunting or human wildlife conflicts," Meilvang said. "Most of them would have been taken away from their mum at a very young age." But Joko Junior is one lucky baby chimp - growing up with his mom and her friends, as well as the kind human helpers at the sanctuary. At first, though, Jerry was initially a little impatient with the surprise baby. She carried him on her back even though he was a little too small to hold on. Breastfeeding was another challenge. "She would also be very impatient when he was breastfeeding and only allowed him to drink for a few minutes," Meilvang said. "In the beginning we were observing her very closely to make sure that he got enough milk and grew as he should." But Jerry has come around and seems to enjoy motherhood - thanks to a little help from her friends. "Especially Gola and Jerusalem like to hold Joko Junior, and his mum is happy to let them carry him around," Meilvang said. 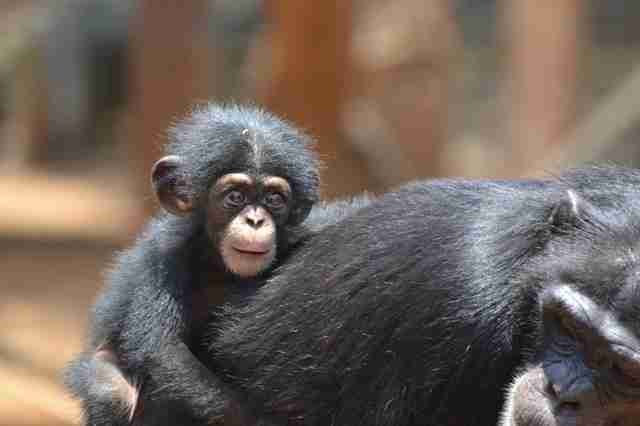 "It is normal in a chimp group that everyone is interested in the babies and holds them for some time. Jerry seems to be happy to get a little break from her motherhood once in a while." As for Joko Junior, he's growing up fast. "He is now almost 5 months old," Meilvang said. 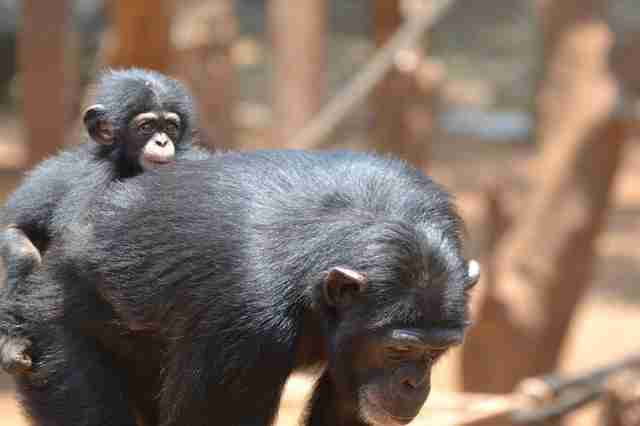 "He will be a strong little chimp one day." Click here to learn how you can help Joko Junior and his family at Tacugama.